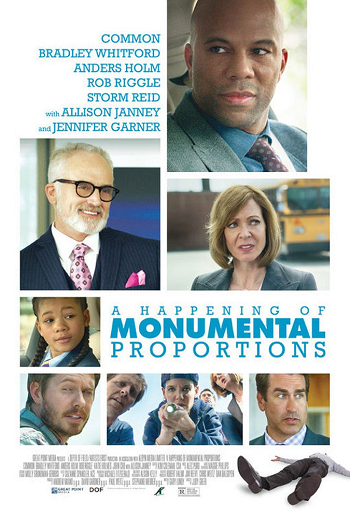 Starring Common, Allison Janney, Bradley Whitford, Rob Riggle, Jennifer Garner, Anders Holm, Storm Reid, Marcus Eckert, John Cho, Katie Holmes, Nat Faxon, Kumail Nanjiani, Marla Sokoloff, Mary Birdsong, Al Madrigal, Lily Mae Silverstein, Monica Young, Rowan Smyth, Brendan Hunt, Debby Gerber, Michael Berthold, Jessica Mikayla Adams and Keanu Reeves. Distributed by Great Point Media. 82 minutes. Rated R.
A Happening of Monumental Proportions, the first film directed by respected comic actress Judy Greer, has a similar outlook. The “happenings” of the title may seem inconsequential on the surface – a gardener felled by a heart attack (tragic for him, but an inconvenience for most of the characters in the film who barely knew who he was), being the new kid in school, a cut cord on a coffee machine, a spiteful husband wounded by an office fling, a career day gone awry, having to close off the teachers’ lounge in the middle of the day, grown men acting like children – but these are the catalysts of everything of note that happens in the film. But these little moments, these little coincidences, these minor headaches in a modern life can become huge calamities if circumstances are just right. Annoyances can be even more powerful than actual calamities. At least we are (usually) ready for those. A Happening of Monumental Proportions is a vaguely surreal dark comedy/drama, a look at the foibles of adults and children. It is mostly centered around an elementary school where the gardener has dropped dead of a heart attack just before the children start to arrive and a corporate center where a new efficiency expert is taking over a grossly inefficient corporation. Bradley Whitford’s new exec comes in like a whirlwind, sort of like Alec Baldwin in Glengarry Glen Ross. (“Coffee is for closers!”) He just happens to show up on a local exec’s (Common) worst day – his affair with his secretary (Jennifer Garner) has exploded and now he is getting harassing calls from her husband (Keanu Reeves), insisting they meet and have it out. Now his new boss seems determined to fire him, all because of the damn coffee machine. In the meantime, at the school, the principal (Allison Janney) and vice principal (Rob Riggle) have the very odd job of moving and hiding a corpse before their students are traumatized. (The requested ambulances and medical examiners can’t seem to make it in for hours.) Add in a vaguely stalkerish 12-year old boy and a teacher who may or may not be considering suicide, plus a career day where the adults act more childish than the kids, and what starts as a normal day quickly turns hysterical. Much like the actress-turned-director at the helm of the film, Happening deftly juggles the serious and the delirious. With an extremely strong cast – my one small complaint is that West Wing compatriots Whitford and Janney are given almost no screen time together – this amusing-but-slight film is always watchable. It’s not going to change anyone’s life, but it’s funny and quirky and sometimes rather profound. However, honestly, many of the characters could use being a little fleshed out. Only a few come off as truly likable. Too many, in the long run, you don’t really care enough about what happens to them. Even at the end, it seems like most of them will continue to muddle through their dead-end lives, jaded and a little dissatisfied, fearful of what the future will bring. Hopefully they will be careful when they bend over. Tags: A Happening of Monumental Proportions, Al Madrigal, Alec Baldwin, allison janney, Anders Holm, Bradley Whitford, Brendan Hunt, Charles Bukowski, Common, Debby Gerber, Glengarry Glen Ross, jay s jacobs, Jennifer Garner, Jessica Mikayla Adams, john cho, Judy Greer, Katie Holmes, Keanu Reeves, Kumail Nanjiani, Lily Mae Silverstein, Marcus Eckert, Marla Sokoloff, Mary Birdsong, Michael Berthold, Monica Young, movie review, Nat Faxon, PopEntertainment.com, Rob Riggle, Rowan Smyth, Storm Reid, The Shoelace. Bookmark the permalink.